Drawing from her forthcoming edited collection, Sustainability: Approaches to Environmental Justice and Social Power and her current project Environmental Justice in a Moment of Danger, Sze asks how do we “situate sustainability?” How does the ways in which sustainability is conceived and researched matter now, in the most anti-environmental Federal administration ever? The histories and frameworks of the environmental justice movement are important because of the ways in which activists frame their problems and responses. Thus, the movement’s vulnerability is the paradoxical source of strength, a lesson for those interested in what and how resistance looks like in a moment of danger. 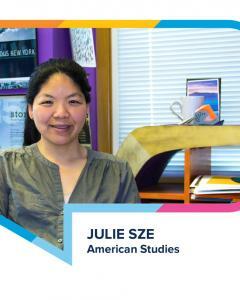 Julie Sze is Professor of American Studies at UC Davis. Noxious New York: The Racial Politics of Urban Health and Environmental Justice (MIT Press), won the 2008 John Hope Franklin Prize. Fantasy Islands: Chinese Dreams and Ecological Fears in an Age of Climate Crisis was published by UC Press in 2015. Sustainability: Approaches to Environmental Justice and Social Power is forthcoming (NYU Press: 2018). She has written 45 articles and book chapters, in environmental studies and the environmental humanities, geography, and public policy. She collaborates with environmental scientists, engineers, social scientists and community-based organizers in California and New York.